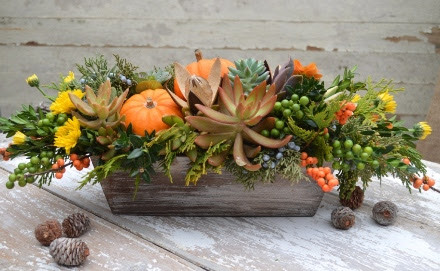 17 Nov Thanksgiving Tablescaping the Natureworks Way! we are lucky to have this refuge. I spent all day Sunday planting the rest of my perennials and cleaning out my frozen vegetable beds. The incredible full moon on Mondaymeans it’s time to plant root crops, specifically spring flower bulbs! We’ve got plenty, and they are on sale at 25% off. Diane has banished them to the fertilizer shed to make room for the complete transformation of that room of our shop to Thanksgiving decor. 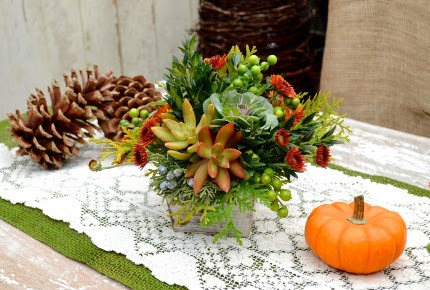 Amber and my team of designers have been making beautiful centerpieces, cornucopias, succulent pumpkins, and more. We welcome special orders and will be open until 5 pm on Thanksgiving eve with plenty of fresh creations for last minute pickups. We are, of course, closed on Thanksgiving for family time. Be sure to check our Facebook and Instagram posts regularly. As we make cool stuff, we will put it up for all to see, reserve, and order. Yes, believe it or not, we DO have daffodil bulbs left. Here is my strawberry bed last spring. I plant bulbs everywhere! We also have some Alliums, hyacinths, Fritillarias, tulips, crocus, grape hyacinths, and a lot more. Plant your bulbs THIS WEEK! Women and power tools- look out! what goes into the planning and preparation for the next few crazy weeks, you would be surprised. 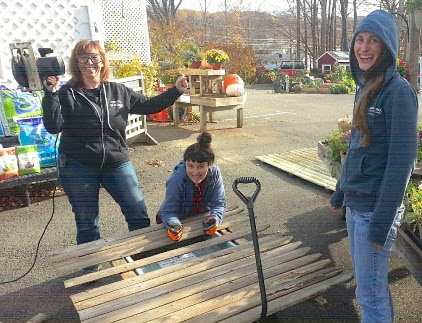 Last Wednesday I stopped at the shop to pick up another load of plants for a job I was working on only to find Amber, Jillian, and Diane sawing up an old stockade fence. Turns out they were making my workbench in the greenhouse design studio. 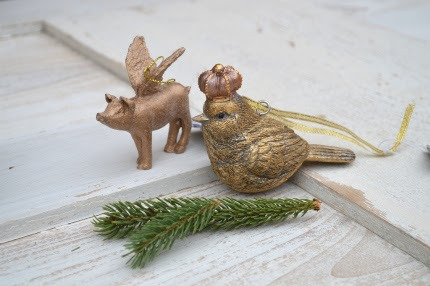 tiny trees made of seashells…eggs hand painted in Austria…fluffy owl ornaments… kitty cats and dogs… We only have a few of each style, so if you see it, grab it! 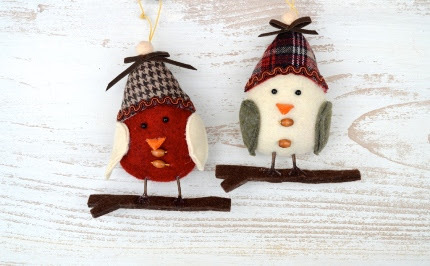 We can help you put together a collection of ornaments for your adult kids who are just starting out with a new home. Ornaments are an excellent choice as a teacher’s gift or a way to say thank you to your hairdresser. 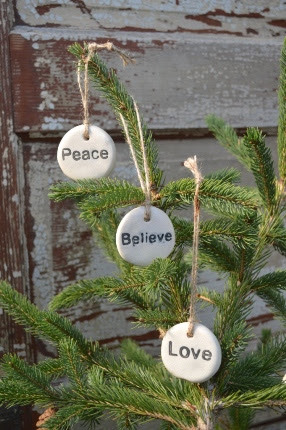 Start a tradition, giving your children, grandchildren, nieces, and nephews an ornament each year. As they grow older, every time they decorate at Christmas they will think of you. Shop Local. Shop Small. 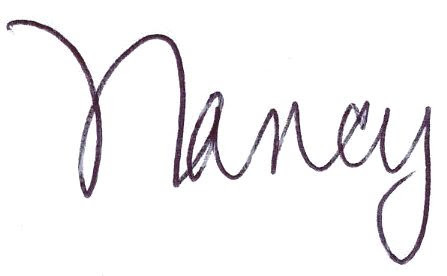 Make it Personal. It’s so important to tune into meaningful messages and thoughtful ideas right now. Peace, believe, love are words we can live by. Many of the decorations we have will inspire and uplift you. Once again we will be making PEACE WREATHS. Each is unique and made by hand. If family will be in town and you will be visiting the cemetery to decorate the grave of a loved one, realize that we offer an alternative to pots filled with greens and plastic poinsettia branches. We make grave pillows and blankets by hand, using our own fresh, mixed greens and natural berries. We add pods and cones and the waterproof bow of your choice. These special creations have become a tradition for so many. 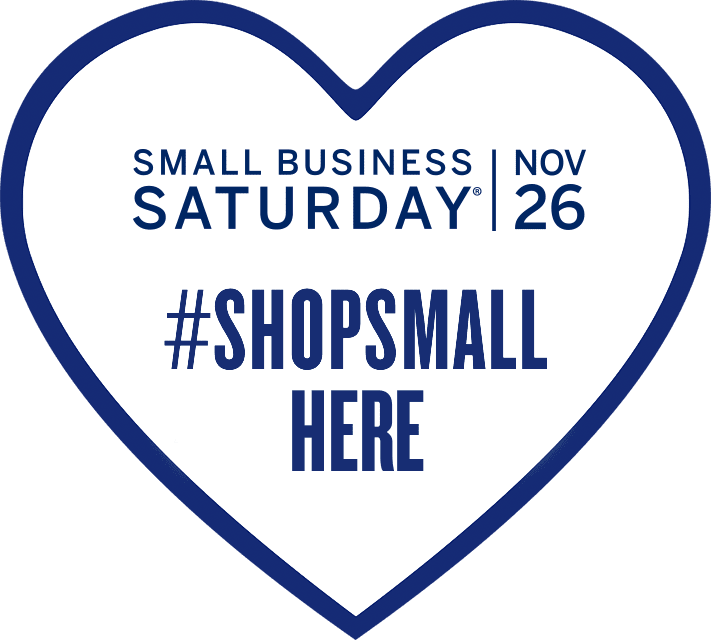 We are proud to participate in Small Business Saturdaythe weekend after Thanksgiving, a wonderful day that supports small businesses sponsored by American Express. We will have free locally made donuts, organic coffee, AND Santa will be here from 10-2. The Friday after Thanksgiving is officially GREEN FRIDAY at Natureworks. Details on these and all of our fun events can be found below. Please don’t forget to share your favorite Small Business Saturday moments on Facebook, Twitter, and Instagram with #ShopSmall. It is vital that we join together to strengthen the bonds in our communities and neighborhoods. Supporting a local business that has been serving the area and creating jobs for over 33 years is one way to sustain a better world for all of us. 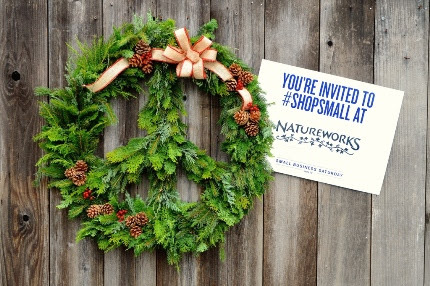 Stop in for a visit soon and be sure to Shop Small at Natureworks on November 26th.